It was a still night in the Brisbane Ranges. The bright light of the full moon was dimmed by mist. Out of the white haze along the ground stood trees, those closest to us appearing black. Trunks behind them were grey, becoming paler with distance, until they faded into invisibility. While we waited for the rest of our group, we scanned the trees. A grey brushtail possum gazed down at us, its fluffy black tail hanging down beside the branch; large ears, pink nose and dark eyes alert. Careful! Don’t shine the spotlight in its eyes. We don’t want to blind it! It ducked behind the trunk, out of view. Soon the group assembled and we began our walk along the bush track. More possums were seen, going about their nightly business in the tall pale-branched Manna Gums, trunks dark and rough, long ribbons of old bark hanging from their branches. We followed the slow ‘mo-poke’ call of a Southern Boobook Owl, hoping for a glimpse of it. In the distance another boobook answered. A member of the group repeated the owls’ calls, hoping to attract one to us, but as the birds’ calls became more distant, we gave up. Sharp eyes noted a mat of prickly leaves on the ground, with small cranberry heath flowers, red tubes splitting at the end to five tiny hairy points. A cluster of Parsons Bands Orchids was found, each with two white petals reaching out and down. Then, eyeshine, up in the wattle tree. A small grey head with rounded ears and a black stripe between them. Sharp claws gripping the trunk as it faced downwards. A loose fold of white skin between front and back legs. A Sugar Glider! It stayed frozen as we gazed at it, the two wildlife photographers clicking away enthusiastically. Then it began to move its head from side to side, perhaps using sharp incisors to cut the tree’s bark, creating a wound that would ooze sugary sap, an evening meal. When the photographers were satisfied, we continued our walk. We turned onto another track, hoping to see the prize we had come for, a Powerful Owl, known to be in the area. We noticed a rare patch of Snow Gums, trunks pale all the way to the ground, veins of the leaves almost parallel. Above, we heard the high-pitched echolocation calls of White-striped Freetail Bats hunting flying insects, and in the distance a repeated yap from a Sugar Glider. More eyes. Something large and brown in a tree. There it was! Australia’s largest owl. 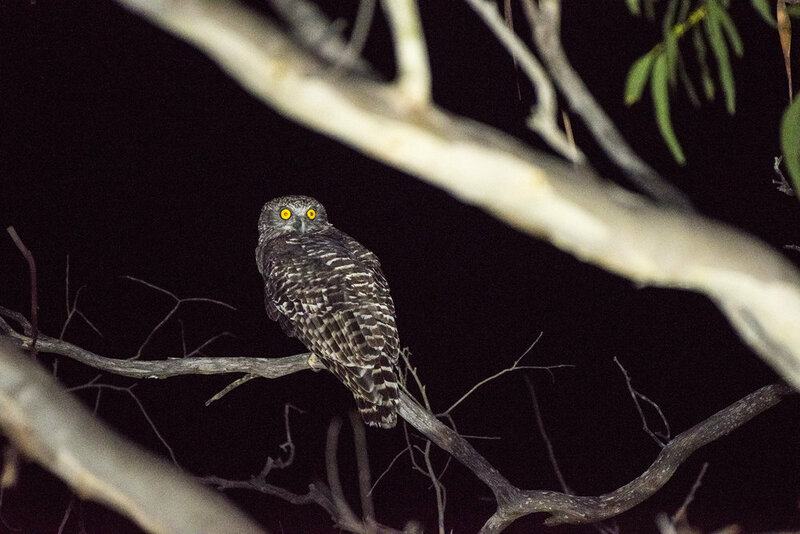 The Powerful Owl was huge, sitting on its branch, brown feathers with white markings, bright yellow eyes with large black pupils staring down at us and away. The photographers were joyfully busy. The rest of us watched the bird in wonder. It spread its long pale wings and silently flew to another tree. After a few minutes, the spotlighters found it again. The watching continued. A rustle in the trees across the track. The owl flew towards it. We left it, hunting for a meal, probably another possum. Some of us were tiring, so we turned back along the track, searching for more eyes and listening to the sounds of busy nightlife. Towards the end of the walk we heard the growling squabbles of brushtail possums. There were four in the low leafy branches of a Manna Gum, arguing over territory or food or mates. One climbed down the curved trunk and walked among the grasses. It sat up on its hind legs looking around. We could see the dark stripe of a scent gland down its chest, marking it as a male. Back onto four legs, walking towards us! When he was close, he turned and walked away along the track and finally back into the grasses. We continued back to the cars. The mist was gone, but the moon was still dimmed by light cloud. We enjoyed the black silhouettes of tree branches and leaves against the grey sky, said goodnight, and drove home to bed, leaving the animals to continue their busy night. Wendy Cook lives on a farm west of Melbourne with her husband and two teenagers. She loves watching the nature she sees around her every day and writing about it. She is a volunteer with Fungimap and at her local primary school where she hopes to instil a love of nature and reading in the children. Photographer David Whelan is a foundation member of the Australasian Raptor Association (ARA), now Birdlife Australia’s Raptor Group. His photography has graced the pages of several reference books, the latest being CSIRO Publishing’s 2017 release Australasian Eagles and Eagle-like Birds by Stephen Debus. Along with his good friend Bernie McRitchie, he provided the first confirmed successful breeding records for the Black Falcon in Southern Victoria. Photographer in Residence for Martin Scuffins and the team at Leigh Valley Hawk and Owl Sanctuary, David is working on several new publishing projects coming in 2018/19 and is preparing to launch a website showcasing his skills later this year. Banner image courtesy of David Whelan.